Are you looking for some good iPhone conversation? From the Forums is a great way to see what all of the current hot topics are on the TiPb forums. In order to create any new threads of your own or reply to any of the existing threads, you must be a registered member. Becoming a member is a simple process that will only take a few minutes out of your day, so if you have not already already done so, head on over and register now. First topic up for today, App Store Genius and how is it working for you? Rene doesn't seem to be having the best of luck with his Genius, for me it started out pretty so-so but it seems the more I delete the more accurate it seems to get. Perhaps my mind is playing tricks on me, how is it working for you? iPhone OS 3.1.2 was released yesterday and we are assuming most of you jumped right in and updated your phones. Cdudek was wondering, how is your battery life on the 3.1.2 software? Anyone notice a significant change for the better or for the worse? Check the thread out to see results from other forum members and while you are there, post your own. This next thread for today comes to us from naviwilliams and he offers up a question that we hear quite often - do you leave Wi-Fi on or off? It is a fact that using Wi-Fi over 3G will save you a decent amount of battery life so I have a tendency to leave it on since Wi-Fi is available to me at work and at home. How about you? 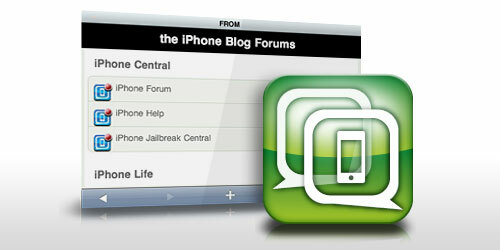 Last up for today is one of my personal favorite forums to check out - the iPhone Jailbreak and Unlock forum. This is the place to check out if you are interested in jailbreaking or unlocking your device. Most of the time you can find the answers to your questions within minutes.